AstroPay is a prepaid virtual card for South American residents accepted as a deposit option at many of the world’s best online casino websites. This guide will take you through how to use Astropay safely to transfer funds to your Internet casino account for online slots and table games play. Astropay is an online prepaid debit card you can use to pay for things on the Web and to deposit money into your Internet casino account. As a virtual prepaid card, Astropay exists only in the digital space and is essentially a debit card in World Wide Web form, designed to exclusively pay for online things – in our case, to fund our real money casino accounts so we can play slots, poker, blackjack, roulette and more. You buy and load funds into your Astropay prepaid card via direct bank transfer, credit and debit cards, eWallets or even cash, but don’t have to have any of those personal funding methods linked to your casino account thanks to Astropay, which acts an additional layer of security. Balance amount and transactions made using the card can be managed on the official Astropay website. Why should I use Astropay for online casino deposits? For those who desire extra privacy and peace-of-mind, Astropay is a highly recommended casino site deposit option. Funding your online casino account with Astropay means you do not have to provide your personal bank accounts, credit or debit cards and other financial information directly to your preferred online casino – all they have is your Astropay details. For the gambler who wants to be anonymous, this is a great advantage in using the Astropay service. Astropay is also entirely free to purchase. There are no hidden fees or service costs to register for an Astropay prepaid virtual card. Depositing money into your casino account using Astropay is also an instantaneous process, which is good for people who hate waiting the 1-3 business days other methods like direct bank transfers take to process your funds. Finally, Astropay’s design as a prepaid virtual debit card means you won’t spend more than you can afford to bet when playing your favourite online casino games, like baccarat, blackjack, and roulette. For players who want to abide by a strict bankroll limit, the value of a prepaid deposit method cannot be understated. One small disadvantage to Astropay is you cannot use it to withdraw winnings from your online casino account. It is purely designed as a payment/deposit method only. To withdraw any winnings you may have, you will have to use another supported method. Sign up for an account at the official Astropay website and register for a card, providing basic customer information (name, date of birth, ID verification, etc) and confirming your account via email confirmation. Once your account is activated, select the type of card you want to ‘buy’ and then pay the amount you wish to load into it in your local currency (which is converted into dollars) via direct bank transfer, traditional credit and debit cards, or e-Wallet. Depending on which method you choose to fund your Astropay card, the funds can be ready to use within 3 days or instantly. 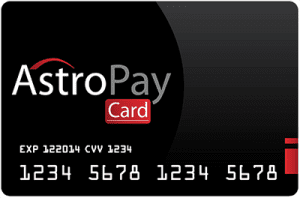 Astropay prepaid cards can be bought in increments of $25 up to $500. After payment has cleared, Astropay will send you an email with your 16 digit virtual Astropay prepaid card number and the 3 digit CVV code. It will be officially activated and ready for use at online casino websites and hundreds of other Internet merchants, and last up to 12 months from purchase. It cannot, however, be reloaded with new funds, so make sure to take that into account. Which casino sites can I use Astropay as a deposit option? Currently, a decent number of online casino websites offer Astropay as a deposit option. We will update this section whenever it is added as a deposit and withdrawal option at our recommended real money casino sites. Which countries is Astropay available? Using an AstroPay card is only available to people living in various South American countries, which we will list in full below.